GeekDesk® standing desks are engineered to stand out. You can't go wrong with the high-quality craftsmanship of a GeekDesk®. Your new desk will look great and function seamlessly whether you're at the office or at home. The charm of our engineering isn't just to look pretty on the outside. What really matters is the foundation that we build our adjustable height desks on. The quality and robustness that GeekDesks are known for means that our desks last longer. So what is the secret? We'll tell you…. We gave special consideration to making sure the GeekDesk® was designed with extra attention to its stability. Our Cross Bar feature is what sets us apart from our many competitors who choose to ignore it. The long legs that are part of any standing-level desk means that the frame's geometry matters a lot to how stable it is. Our crossbar is a simple but powerful addition that uses some basic geometry to keep your desk steady. It's also far enough back that it won't hit your knees, and high enough that you can put a walking treadmill under it if you want. In other words, it makes your standing desk more powerful, strong and robust! We make sure that our standing desks are made of the world's most used high-strength metal, steel. We want your desk to change your life and last a long time so we use the best materials! Our buildings, bridges and cars are all made with steel, so why not your desk? Its inherent strength resists fatigue, stress, dings and scratches. Plus our powder coating fully protects against any corrosion. Steel is energy efficient, durable and fully recyclable (in fact, it's the most-recycled metal on the planet! ), so it was the obvious choice for our frames. If the crossbar section wasn't enough we even go one step farther… literally. 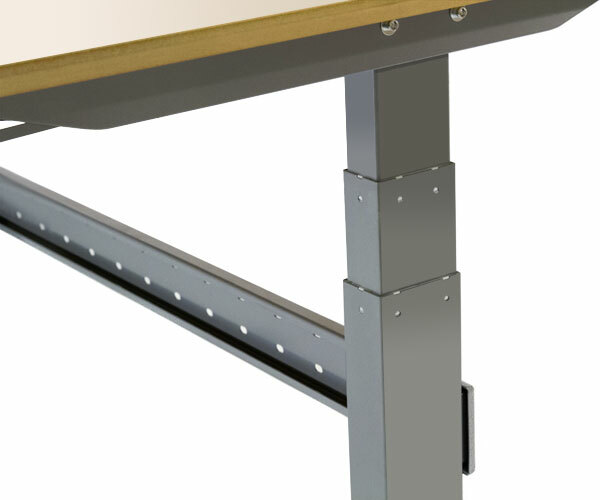 Our three-section legs extend across a greater range of heights than the two-section legs of many competing desks. It's all part of making sure the GeekDesk® is designed with versatility in mind, for all kinds of people - which means you can work higher, lower and anywhere in between. We know for our desks to be part of your life, they have to look good in your home or office. That's why we treat our desks like a work of art as part of our craftsmanship. Allowing you to connect with your desk and being inspired and proud to work at it. Our designs are modern and timeless. You can choose from an array of finishes and sizes to suit your needs. From a natural bamboo finish to give a light, fresh and clean feel, to the warmth of our beech veneer or black laminate. These options allow you the freedom and creativity to customise your desk to your personal preference and detail. Completing the look of your high-quality craftsmanship of a standing desk which will look great and function seamlessly at home or in the office. GeekDesks may be big, strong and beautiful, but we are built on love. We constantly strive to provide the kind of support we would expect ourselves. So that's exactly what we give. Love, Love and more love. If you have a problem with your order, and assembly issue or just want to talk GeekDesks, our dedicated state-side support team will do everything in their power to quickly get your desk setup and running properly. Ask around, and you'll find we have a sterling support reputation. Put simply, we make sure our customers are taken care of. So what is the secret? We'll tell you…. From a simple touch of a button our height adjustable desks will glide effortlessly to the height you are comfortable with and the perfect ergonomic position. It makes standing easy, enjoyable and refreshingly smooth in just seconds. You don't want to stand all day. You need to switch things up but you don't want that process from sit to stand to be a difficult one. Our touch technology and electronically synchronised dual motors will make your transition as quiet as a whisper. Our deep passion and drive to improve your personal and professional lives has resulted in products that are more than just a desk. Our desks are a way of life. We engineer GeekDesks with heart and soul to give them character and charm. Living and breathing health and productivity into your life. We have a heart to serve our customers with furniture that will improve their lives. We know the impact it has on your health and happiness. So we go above and beyond expectations to deliver a superior product, service and experience. We take the same approach towards serving you as our customers as we did when we were meeting our own needs all those years ago. We carefully craft our designs and innovations to ensure we go above and beyond our customer expectations and market standards.Quality is at the heart of our focus. Solid, robust, high-quality standing desks that last is how we can best serve you along with our service and smiles. It all started with a back injury at the age of 17. Ten years later our company's founder, Donovan McNutt, found himself in pain and often uncomfortable from having to sit at a desk all day while working as a software developer. At the time, most "ergonomic experts" were simply prescribing that people just "sit in the right chair, with the right posture." Having learned to listen to what his body was saying as a result of ongoing noninvasive back treatment, he realized his body was saying something much simpler, and quite different: "Stand up! Move around and change positions once in a while!" Adjustable-height sit/stand desks had been around for a few decades, but they were extremely expensive (often $4000 or more for a basic desk), and difficult to buy -- typically only sold through dealers who added unnecessarily steep markups, and almost never for sale over the Internet. Frustrated by this, in 2007 Donovan began prototyping his own solutions to the problem, testing the prototypes in his real-world desk work as a software developer. Being able to stand part of the day made such a difference in his life that he decided to market the original GeekDesk frame to his peers in the technology industry. Little did he know how much the need would resonate! Profitable from the onset, GeekDesk quickly grew from a tiny startup into a leading brand that helped pioneer sit/stand desks in North America and worldwide. Starting in 2010, GeekDesk started to to be featured in major publications such as the New York Times and International Herald Tribune, the Wall Street Journal, Forbes, Financial Times, USA Today, Washington Post, Wired, Tech Times, ZDNet, and hundreds of others. Explosive growth followed suit, as people began to "get" what "Work Sitting. Work Standing. "® was really all about. We continued to innovate and improve our desk line, following up the GeekDesk Original and Mini with the v2 and Max, and later the current v3 and updated Max models. Our commitment to excellence in customer service meant our growth would continue to be a good thing. We're delighted to have played a part in bringing multi-posture workstations out of technology's backwaters and into the mainstream. Call them what you will -- adjustable-height desks, standing desks, or sit/stand workstations -- working at a desk that lets your body work the way it was designed to, quickly and flexibly accomodating various postures, will change your life. We love the fact that our desks support people and help them live and work in a way that is much more life-filled than being chained to a desk chair all day. Our customers are smart, talented people who do amazing work every day. We have the privilege of serving them by providing high-quality, affordable standing desks that supports their work, day in and day out.